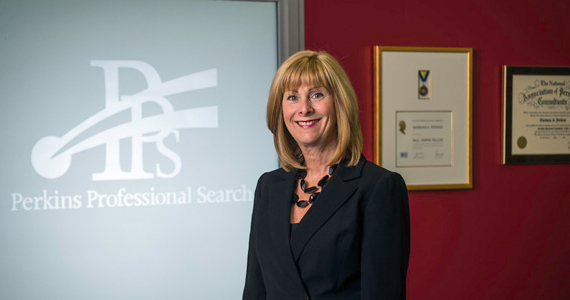 Perkins Professional Search (PPS) was founded by Barb Perkins, an expert recruiter with decades of professional experience. Barb commenced her Recruitment Career in Washington, DC where she thrived, earning several awards and was soon promoted to General Manager. During her eight year tenure, her branch was consistently recognized as the #1 office for production. Barb’s journey brought her to Edmonton in 1992, where she joined Harcourt Recruiting Specialists. She was appointed Vice President in 1997 and was the top producer for 17 consecutive years. Barb’s focus on nurturing long-term business relationships played a pivotal role in this success. After 17 years with Harcourt, Barb was ready for a new challenge: becoming a proud business owner. Enter Perkins Professional Search, a premiere boutique search firm that focuses predominantly in the Property& Casualty Insurance industry. PPS is committed to customer satisfaction and professionalism. Our focus is on permanent, long-term placements that are built on the best fit for both employer and employee. We will work to help facilitate your journey while providing strategic solutions for your success. I would highly recommend Barb Perkins and her staff at Perkins Professional Search. Barb takes the time to know you as a person, what you seek in terms of employment and stays with you with every step, from the first contact to after your employment. Barb is honest, straight forward, knowledgeable, personable and professional. Before you send that first email or contact to a prospective employer, you would do well to contact Barb first. You can be candid about what exactly you seek in your next career position, in my experience Barb will match you with an employer with whom you can realize your full potential.